I haven't blogged in awhile because we've finally moved to our very own house! It's been quite the adjustment period, which hasn't ended yet. We've never had to move with a toddler before and it's proving to be a bit more of a trial than we imagined. 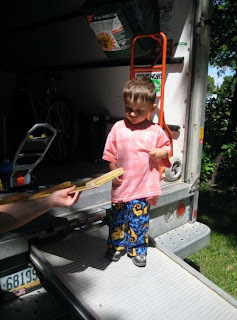 On July 11th, Terry and his brother went to pick up the U-Haul and all our friends came over to help us move. I was "promoted" to supervisor due to my lack of heavy lifting or bending skills. So I watched that Logan didn't get into anyone's way. Mel and Selena accompanied me to Arby's to feed him lunch and then we went over to Wendy's to pick up lunch for the movers. We also made the mandatory Slurpee run (as a side note: it was also Free Slurpee Day on that Saturday and the Slurpees weren't even in bad consistency - a miraculous feat in itself.) We also took Logan over to the wading pool for a dip while the movers moved the last of the stuff into the new house. They did it in record time. I think when all was moved it only took about 4 hours. Of course, there always has to be one stubborn thing. This time it was our entertainment centre, which left the old place fine, but had to be taken apart to fit into the new place. No biggie though, Josh, Cory and Rej put it back together good as new. 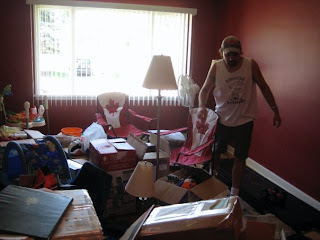 Here is Terry wading through some of the stuff we've had to unpack this past week. After we took possession of the house, we were very excited about going to visit it even just to put a few boxes from our car there. It seemed that every time we did this (or every time Terry did this by himself) we were greeted by another set of neighbours. Both of us are very unused to the idea of a close knit community of people, but we better get used to it! All of them are very nice. They learned our names right away and welcomed us to the neighbourhood. There are even 2 pregnant women (besides myself) on the block with little boys close to Logan's age. Whaaaa??? The grandparents next door even offered to watch Logan for us if I went into labour in the middle of the night and couldn't find anyone in time. Wow! We've already gotten to borrow tools from our other neighbour and the one two doors down offered to let us use his lawn mower if we didn't have one yet. Seriously - it's like the Twilight Zone out here for us. A small part of me fully expects to be invited into some sort of freaky cult any day now. But I know that they are just nice people and we are lucky to live in such a wonderful neighbourhood where you don't have to worry about your kid playing in the front yard, because 6 people will be watching to make sure he doesn't get into trouble. All that's missing are the white picket fences. Logan had to make sure that his prize possession - his bubble mower - made it safely onto the truck. Logan is slowly adjusting to the new place. He still asks us every now and then if we are going back to the "moldy" house. He is still treating this one as an open house. He has to check out the shed and the backyard every time we get out of the car. He goes around closing every door and turning on every light and "checking" out various rooms. It's exhausting, but it's getting better. He is sleeping most nights in his own room and we're starting to get back into the routine of living. Most of this progress is thanks to Terry who has been staying up late every night to unpack everything. We figure once this place looks like home, Logan will be better adjusted. We're kind of sad though that he probably won't remember our old place at all (other than in pictures) and that's the place we took our newborn baby to. It has a special place in our hearts always. We're having a housewarming BBQ tonight in our spacious backyard. Some of our neighbours have also agreed to come. They are not the type to pass up a good beer and BBQ! We should have great weather for it. And then it's on to the next thing ... baby is due to arrive any day now! We are all blessed to live in such a fabulous country as Canada. Let's take some time to celebrate! - The area size of Canada is a whopping 9,984,670 square kilometers. - There are more donut shops per capita in Canada than in any other country. We love our Timmy's! - In Manitoba, 7-Eleven stores across the province sell an average of 8,330 Slurpee drinks per month. The rest of Canada sells an average of 5,990, which makes Manitobans the world leader in Slurpee sales. - Pamela Anderson was though to be Canada's Centennial Baby, being the first baby born on the centennial anniversary (she was born at 4:08 in the morning). However, the Campbell River Upper Islander of July 5, 1067 reported a baby born two hours earlier on the same Canada Day. - The electron microscope (1938), the snowblower (1925), the baby food Pablum (1930) and the sipper (1934) were all Canadian inventions. - Canada's universal health care system, internationally recognized as one of the best medical systems in the world, began with the Medical Care Act on July 1, 1968. - The widely distributed board game Trivial Pursuit was conceived in 1979 by two Canadians, Chris Haney and Scott Abbott. Yachtzee, Balderdash and Pictionary were also Canadian creations. Happy Canada Day from Team T-Lo!